Love them or hate them, either for speed, comfort or just not being stuck in a traffic jam, we have probably all used the railways at some point. And with more people using them every year, the level of investment being made in Britain’s railways is staggering – delivering new railway lines, new carriages, refurbished stations and more staff. However, all this investment has to be paid for and with customers wanting cheaper travel this can’t just be funded through ticket sales. Many people now see Britain’s privatised railway as run by big transport companies or overseas train operators. However, if you take a closer look you’ll see that many stations and routes act very much like SMEs – working to grow their local market by encouraging people to try their products and marketing their benefits over the competition. While this can be successful at medium and large stations, many of Britain’s 2,500 stations are small and often unstaffed, making it hard to promote them in their communities and to encourage new passengers. Since the mid-90s many people have been working with their local train companies to help make the stations a real part of their community, either through cleaning and decorating the station to make it more welcoming, through to opening small shops or tourist information offices to make use of empty office space. This movement quickly became known as ‘Community Rail’ and for over a decade has been overseen by the Association of Community Rail Partnerships (ACoRP). For the rail industry these groups provide extra hands to help keep their stations looking good, and a chance to tap into external investment for their work and services that generates more passengers. However, many of these are small groups, usually comprising volunteers and often trying to make a real difference to their community with little resource. ACoRP, supported by the Government’s Department for Transport, already does much to help these groups, and each are part-funded by their local train company and often their local Councils. However, funding can also be equated as subsidy, and in these times of austerity and declining budgets, it is more important than ever for such groups to work to develop their own funding streams and even seek to become self-sustaining. CrossCountry, arguably Britain’s most expansive train operator with routes from Scotland to Cornwall and Wales to East Anglia, is unique in the railway as it manages no train stations. So unlike other train operators it has no buildings or facilities with which to work with Community Rail Partnerships (CRPs) and is therefore free to take a more strategic and facilitating role in their support. 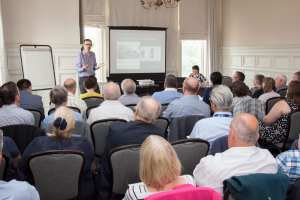 With this in mind, they decided to use the opportunity of their first annual conference to bring together representatives from the eighteen CRPs they connect to as well as others seeking to use rail to benefit their localities, for a workshop in York on 2 June. The main focus for this was a discussion on developing a ‘locally enterprising railway’ toolkit that ACoRP and it members could use to develop new approaches, designed to generate revenue for them to reinvest and grow – essentially seeking to transform groups of volunteers into a new generation of innovators and entrepreneurs. To aid discussion on the day and give the attendees food for thought, CrossCountry invited Leigh Sear from SFEDI and Jan Garill from the Two Ridings Community Foundation to give presentations on examples of community businesses and how they can work. These were followed by breakout groups looking at how to set up and operate small locally-focused businesses in a railway environment, sharing examples of existing activities and looking at whether these could work in other locations. Of particular focus was identifying the challenges and pitfalls of setting up a business, including crucially how to move from being a volunteer to thinking commercially and how to identify markets and customer demand. The event ended with a presentation from Drew Haley, General Manager of the Settle & Carlisle Railway Development Company, on their journey from near closure of the line under British Rail to a thriving community and tourism focused business. “Everyone in the workshops had something to add; either thoughts on retailing opportunities, examples of things they were already involved in or looking at and even suggestions on what local communities may benefit from as well as the partnerships. Our goal now is to ensure this army of passionate people have the capability and means to become financially sustainable, so later this year, alongside our colleagues in SFEDI and the Community Foundation, we’ll be launching our toolkit of social enterprise examples and best-practice opportunities, many of which have come from today. These should offer a chance to explore options, access new markets and develop funding and revenue for the CRPs. In turn these will be creating resilient and vibrant communities which is good for society and Britain’s railways”. “Given the changes in the sector, and the external business environment, it is both an interesting and uncertain time for community rail partnerships and station adoption groups. Trends related to socio-cultural diversity, changing lifestyles and the use of technology provide opportunities to develop services and offerings which will add value to different groups within the local community. At the same time, there are a set of challenges related to accessing funding and resources, as well as being able to articulate a clear value proposition to others, in order to put ideas into action. “As the UK Professional Body for Enterprise we are committed to raising the enterprising skills of all across the UK. And so I was delighted to be invited by Cross Country to contribute to the Cross Country Enterprising Rail event held in York enabling us to share our experiences and knowledge of the development of enterprising skills within social enterprises through both delivery of qualifications and projects.